ULAAN BAATAR, MONGOLIA-MARCH 5 : A Mongolian woman drags cardboard to the truck working collecting and recycling the garbage at a dump March 5, 2010 in Ulaan Baatar, Mongolia. 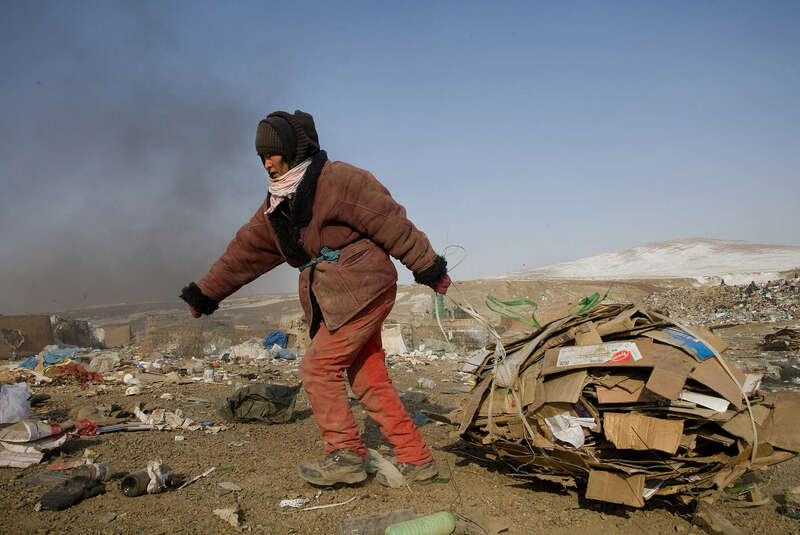 Working at the garbage dump means extreme hardship, long hours outside in frigid temperatures dropping below -25C in the Winter as Mongolia experienced one of the worst Winter in 30 years. Presently the government has declared an emergency requiring foreign aid to alleviate the impact of the " Zud" ( Mongolian term for a multiple natural disaster) caused by bitter cold and thick snow. Currently 1.5 million goats, 921,000 sheep, 169,000 cows and yaks, 89,000 horses and 1,500 camels had died according to the various UN agency reports. Many Mongolians have immigrated to the capitol city from the far away provinces seeking employment, living in rented traditional circular felt yurts with no running water or electricity. Book: "Afghanistan: Between Hope and Fear"